We pick up our 4-wheel drive from Maui rentals in Johannesburg - a brand-new Toyota HiLux with only 200km on the clock. The man shows us the cutlery and cooker, the water tank, tables and chairs, linen, how the fridge worked, and we play with unfolding the tent on top. Increasing nervousness builds up as he explains the high and low 4-wheel drive, and puts in a compressor for pumping up the tyres, a tow-rope, and a massive device for jacking up the beast when on rough ground. Two spare wheels, extra fuel tank etc etc. Do we really know what we've let ourselves in for? Feel relieved we rented a satellite phone at the airport. We set off and I am soon cursing how high the revs are and how slow it is. We pull over and I realise we set off in low 4-wheel drive, for use only in deep sand or mud. In 2-wheel drive it sails down the motorway like a sports car, north to Pretoria and then sharp west down the N4 to Botswana. Our rented GPS, which tells us it's 400 km to Gabarone, is identical to our TomTom at home - realise we should have brought it and just put some local maps on. Lots to learn. Fast driving, hour after hour, and it's pitch dark when we see the bright lights of Gabs and reach the Botswana border. We've got all the right papers, and it's all very friendly and efficient. Noting the sleek shopping malls, expensive cars, masses of traffic lights and the occasional cow in the middle of road, we rely on the GPS to navigate through the city, just as if we were in England. Finally we get to our friends Margaret and Churchill in North Gabarone, to be looked after in fine style. 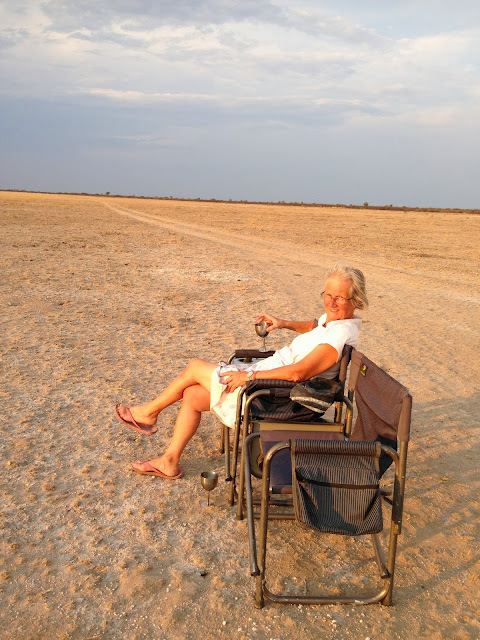 I doubt Margaret has ever been in such a place before, but we urgently needed gin. In the morning we eventually find the National Parks Office to get our entry permits for Khutse Game Park - we note Margaret's proper greeting to the official, asking what was her name, how she was and so on, before getting down to business. Then to stock up with 3 days of food and water in a smart (rather expensive) supermarket. On to Liquorama for emergency booze supplies - Liquorama is at the bottom of Kgali Hill, near the site of Precious Rambotswa's First Ladies Detective Agency, and the arid landscape as we head off North-West towards the Kalahari will be familiar to any readers of the McCall-Smith books. We stop for charcoal and lemons at the wonderfully-named, thriving town of Molepolole, and after 100km or so the tarmac ran out and we have another 100km on an unmade road. This was fairly solid under a layer of sand, and so we crack along at a good pace, listening to the fine Congolese music we had borrowed. Mile after mile of rough road - great fun. The usual charming, friendly welcome at the Khutse park gates, although we have learnt by now to greet people properly, so we ask whether they are well, how did they sleep etc etc, before we get down to filling in the register. Note that the entry 2 rows above was a man from Cambridge, but do not recognise the name and so it doesn't count as a good coincidence. Deflate the tyres to deal with the sandy tracks coming up, and then can't find the compressor. Convinced we have left it behind somehow, but the park wardens assure us they can find us one when we come out. Feel incompetent. We are incompetent, but nevertheless go into low 4-wheel drive and set off. In this mode, you start in 2nd, go up to 5th gear at about 30 kph, top-speed is 40kph which fortunately is the maximum speed in the park. Having been told that trick is to keep moving, we try and keep our speed up as the track turns into 2 parallel ruts full of soft sand. This requires some serious concentration, and we have about 55km of this before our allocated camp-site. The video below gives a flavour, but this was an easy bit. It gets tougher later. The camp site is simple, with a space under a tree, a drop-toilet and a bucket shower. A typical camp site - provides a little bit of shade. Unpacking the vehicle and setting up camp is like playing at 'house' - discovering all the utensils and trying to get water out of the tank using a hose-pipe and the compressor (which we are embarrassed to find was sitting in a compartment after all). We unfold the tent, get the cooker going and start the barbecue. The gin is very welcome, and everything is peace and total quiet. Later, when it is pitch black, we fail to recognise any stars. As the camp-fire goes down, I notice some movement - two brown hyenas are skulking around in proper hyena-ish style. We climb our ladder to bed. Up at sunrise - beautifully cool as we enjoy 'tent-tea', which we have to make ourselves, having omitted to bring along any bearers. All around the site are footmarks. We are very careful not to feed any wildlife, but apparently the hyenas like to lick the barbecue grill. The next night we make sure the hyena-spit is burnt off before we stick our steak on. We head down to the waterhole but not much doing - in fact we find the most enjoyable activity is to sit under a tree and watch the birds - the hornbills are unavoidably comic. We call them all 'Bill'. We sit and sit, trying to keep cool as the sun gets higher. I snooze in the back of the van. A gloriously empty day - we catch a brief glimpse of some rangers so maybe we would get rescued if something went wrong. After 2 nights at the Moroswe camp we pack up and head up to the Molose waterhole where we have been told the lions lurked. And there they are – a male, 2 females, and 3 cubs, sitting under trees and visiting the waterhole, with only us to watch them. It is all very calm, and they look healthy and well-fed. A dead brown hyena is laid out near the water. We sit there for hours with our binoculars, watching the birds and not knowing what they are – a large flock of some pigeon-like things keep circling, sometime clockwise, sometimes anti-clockwise, and we hear the whoosh of wings as they go past. A very large eagley thing sits on a nest on top of tree, red behind beak, grey head, black body. Springbok appear on the edge of the clearing but don't dare come and drink. Wild dogs are bolder. Then suddenly we look up and see a giraffe that has crept up without us noticing. It hovers around indecisively, looking at us but mainly concerned about the lions, as apparently the giraffes are at their most vulnerable when they splay their front legs to drink. It takes about half-an-hour for it to pluck up courage to come to the waterhole. Eventually we set off again, Kate driving, and we hit about 20km of really tough track. Negotiating the deep soft sand is like a slalom on ice, and we’re drifting , steering into the skids, scraping the sides on bushes, but keeping the speed up. Can’t relax enough to film it, but Kate keeps calm, trying not to miss a gear-change as the vehicle rapidly slows down in the sand. But we get going OK even when we almost stop, and maybe we would be fine starting from a standstill. But don't feel like testing it when there is nobody around. It’s a relief to get to our beautiful site, which is inside the Central Kalahari Game Reserve – any further north and they advise going in convoy. Off to have G and Ts sitting looking over a ‘pan’ - a dried up mineral bed. Hot and utterly quiet, with a colony of meerkat-looking things. Also these huge ungainly birds, which I claim can’t fly. But then they take off with much flapping of vast wings. Find out afterwards these are Kori Bustards, apparently the largest flying creatures. Gin and tonic in a 'pan' - hot, empty, completely quiet, wonderful. Then the next morning we drive out of the Park, quite professional by now, get the tyres back to full inflation, stop at Molepolele to buy some fine Botswanan music, and toddle back to Gabarone and dinner with our friends in the Golf Club. The next morning we head back, getting lost in Gabarone until we turn the TomTom back on again and the lady's gentle tones guide us back to frontier. We listen to the great music all the way back to Johannesburg, where with some relief we hand back our vehicle in one piece, after doing around 1600 km in 6 days. Early on in the trip I wondered if we should have gone on a short organised trip up north to the Okavango Delta and seen masses of game. But we can do that another time - the peace, solitude and adventure of the bush all contributed to a fine experience.